TL; DR: For more than 11 years, Giveaway of the Day has been a marketing resource for developers and a supplier of free software to end users. Negotiating with software companies to arrive at win-win promotions both sides are happy with, GOTD hosts free, fully licensed applications and games for 24-hour periods. Its community of users get free software, while developers put their products in front of an audience of 100,000 daily visitors and receive valuable feedback they can use to improve their work. The site, which is now translated into 12 languages, has evolved to offer free software for Windows, Android, iPhone, and a category for games, with plans to add Mac applications in the future. Imagine you’re an up-and-coming software programmer, and you’ve spent months on developing an RPG that you believe could give some of the more established software giants a run for their money. However, you’ve run into one major problem: Nobody has ever heard of you or your game. You’ve spent all of your time and resources on this new product and don’t have much left in the bank to launch a promotional campaign to get the word out about it. This is where a site like Giveaway of the Day (GOTD) becomes invaluable in shining a spotlight on new applications, preventing them from getting lost in the shuffle of a competitive market. While GOTD often helps newer software companies market products, it also lends a hand to more established software companies like AVG, Ashampoo, CyberLink, IObit, Panda Security, and Reallusion in drawing attention to their latest offerings. With more than 300 million unique visitors over the past 11 years, GOTD estimates it’s distributed close to 1 billion licenses. Giveaway of the Day helps software developers promote their work through daily freebies. GOTD receives more than 100,000 unique visitors a day who are eager to download new games and applications, which are available for free with the caveat that they must be downloaded and installed within a 24-hour period. Users find out about giveaways by checking the site daily or signing up for notifications, and they gain access to free download links by sharing the link to GOTD’s Facebook page or requesting a link via email. To prevent illegal dissemination and encourage later sales to users who love a game or application, the free versions on GOTD come with built-in safeguards to prevent piracy and don’t include the free technical support or software updates that come with paid editions. While the benefit is clear to end users, partnering with GOTD serves three key purposes for developers: instant exposure, valuable feedback from users that can be used to improve future versions of applications, and the ability to advertise up to five other products by the same publisher alongside the free software. Software, like most things in life, is rarely perfect on the first try, and early customer feedback goes a long way in pointing out modifications that can take apps from good to great. In fact, many software publishers spend heavily on software testing and survey distribution for this same feedback — a cost that partners of GOTD can largely avoid. Many GOTD promotions receive thousands of comments, which can contain valuable feedback for developers. When GOTD started in 2006, the site was giving away lifetime licenses with the same current rules of no free support or updates. As the SaaS (Software as a Service) model began gaining traction in the industry, GOTD decided it needed to evolve to meet modern distribution needs. “As time passed and the subscription-based model was becoming increasingly adopted by many software developers, we decided it was high time we considered alternative giveaway methods, as well,” GOTD told us of changes to its business model. Now, GOTD is more flexible with its partners, including limiting the number of licenses for a particular application or giving away extended trial versions, which are usually good for at least a year. The goal is arriving at a win-win scenario for both GOTD and its partners, ensuring they are achieving their marketing goals. Piracy is a natural concern when handing out software installation files, but the GOTD team developed a system that prevents users from installing software after the 24-hour promotional period. “Unlike other giveaway websites, we do not bundle installation files with additional components, so our community enjoys ad-free and virus-free experience with any software titles they get from our website,” GOTD told us. While many of GOTD’s promotions are with longtime partners, the team is always actively looking for new software companies to feature on the site. Developers who are interested in marketing through the site can contact them through the GOTD Facebook page or by sending the team an email to discuss campaign opportunities. “We are open to any promotional ideas that developers come up with and are always ready to find a suitable solution for any company,” GOTD told us. After negotiating a mutually beneficial deal with a software publisher or developer, the GOTD team settles on the ideal date for the giveaway, and its editors prepare a promotion page to be approved by the developer before the release. After the giveaway, GOTD provides results from the promotion so the software company gets a clear picture of statistics, including estimated number of downloads, number of visitors, and Google Analytics reports. In recent years, the site has been looking to expand its reach by partnering with more indie game studios with plans to ramp up game giveaways. So this is an ideal time to bring that RPG you developed to GOTD. Within a 24-hour time frame, you can get your game in front of 100,000 users, generating some serious buzz while working out early bugs through their feedback. GOTD was a success early on and eventually cracked the top 1,000 most visited websites, according to Alexa rankings in September of 2011. However, the team is more concerned with creating long-term partnerships than boosting numbers. 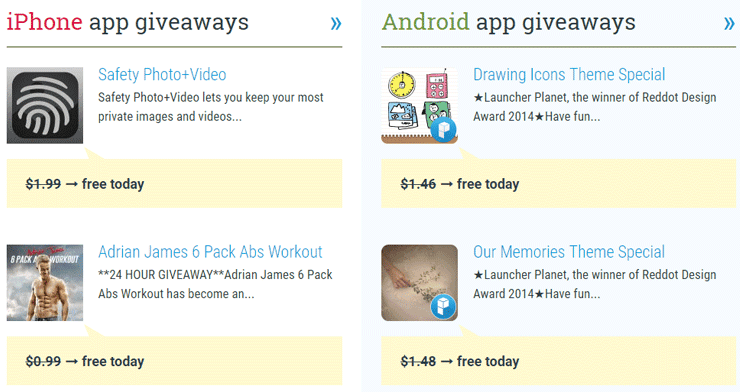 GOTD hosts separate giveaways for iPhone and Android apps, serving a larger audience of users and developers. With users and software developers all over the world, the GOTD team saw the demand for a multilingual site. Since its inception, the site has been translated into 12 languages (English, Spanish, Italian, German, French, Portuguese, Dutch, Russian, Japanese, Turkish, Greek, and Romanian). And since not everyone uses the same operating system or device, the site has also evolved to offer giveaways that go beyond Windows, including game giveaways and applications for Android devices and iPhones.